Simon Morris's amazing lamp design brings the spirit of a bright idea to life through the magic of magnets. Often accompanied by a wide-eyed expression and a raised index finger, a light bulb floating over someone's head is cartoon shorthand for "eureka!" Simon Morris's amazing lamp design brings that spirit of a bright idea to life through inspired design. 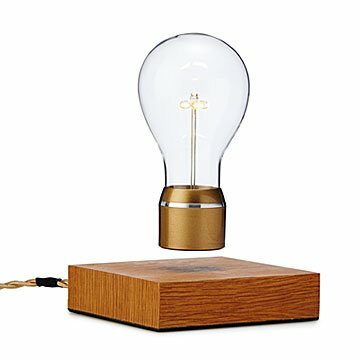 Through the mysterious power of magnets, an LED bulb floats above a quartersawn oak base. Even more magical, the bulb is powered from the base through electrical induction—no batteries required. Turn the light on and off with a light touch on the base, and don't worry about its lifespan: The warm, steady light is rated to last 50,000 hours. Designed in Sweden. Made in China. At 16, American-born, Stockholm-based designer Simon Morris dreamed of having a hoverboard. He began experimenting with magnet prototypes, eventually building a hoverboard 15 years later that floated (even if he was unable to ride it). "Although I thought levitation was cool, I began experimenting on how this technology could be developed further and combined with wireless power based on Nikola Tesla’s experiments," he says. "Suspension [of objects]… has a direct relation to the suspension of belief. It references the floating sensation we feel while dreaming, or our childhood fantasies of magic carpet rides." Now an installation artist and inventor, Simon has turned floating things in space into a beautiful profession. His co-workers have nicknamed him "Magneto," for the X-Men character whose superpower is levitation. Base: 5" L x 5" W x 1.2" H; Light: 5.5" L x 2.25" W x 1.8" dia. Keep product away from magnetic items. (credit cards, hard drives) Inside use only. Do not use in wet surroundings.